Souley Vegan (Oakland, CA) – eat.drink.craft. 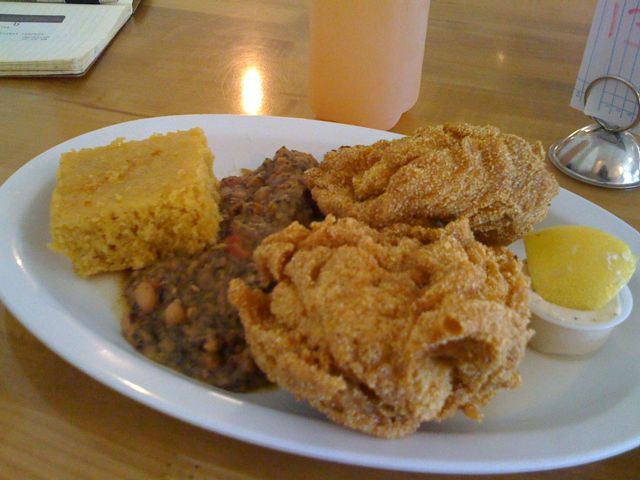 I didn’t realize that I had a hankering for Southern-style soul food until my food was set down in front of me. I had come to Souley Vegan on a last minute recommendation from a friend, who told me nothing more but the name, cross streets, and a warning that it was a bit of a walk from the BART station (“but well worth it”). I eagerly trotted down Broadway, keeping an eye out for the sign. It’s a very casual atmosphere inside. 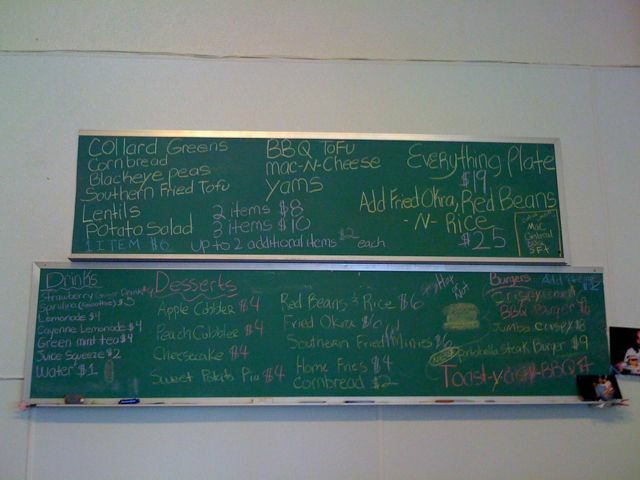 To order your food, you need to come up to the front where the chalkboard menu is located. If you can’t tell from the picture, there are a list of about 10 items to choose from. You can get a plate of 2 items for $8 or a plate of 3 for $10. There are also burgers and other specials. Are you drooling? If you’re not, there’s something seriously wrong with your taste buds (or my iPhone camera). Because I was immediately drooling after the runner set the plate down. I had the presence of mind to take pictures before digging in. Seriously, look at that golden, crispy breading. More than half of each delicious mound was breading, with a thick slice of tofu inside. It was to die for. And the black eyed peas? I don’t even know how to describe how perfectly seasoned they were. The corn bread was too sweet for my taste, but the texture had a warm stickiness to it that I liked. Crumbled and mixed with the black eye peas, it did all right. If you’re ever, EVER in the Bay Area, and particularly in Oakland, GO HERE. Absolutely, hands down, the best, most exciting food I’ve had this whole week. And it’s close to the Trappist, which I wrote about last week, so you can go have some delicious beer after some delicious food. This entry was posted in eat and tagged southern food, vegan. Bookmark the permalink. Thanks for the tip–I will go there next time I’m in the bay area!